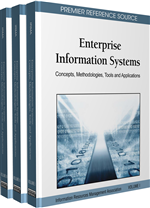 The concept of an Enterprise Information System (EIS) has arisen from the need to deal with the increasingly volatile requirements of modern large-scale organisations. An EIS is a platform capable of supporting and integrating a wide range of activities across an organisation. In principle, the concept is useful and applicable to any large and SMEs, international or national business organisation. However, the range of applications for EIS is growing and they are now being used to support e-government, health care, and non-profit / non-governmental organisations. This chapter reviews research and development efforts related to EIS, and as a result attempts to precisely define the boundaries for the concept of EIS, i.e., identifying what is and what is not an EIS. Based on this domain analysis, a proposal for using goal-oriented modelling techniques for building EIS is constructed; the proposal is made more concrete through illustration via an example.